Rhetoric Thesis: For purposes of clarity, this course should not only be considered for high school seniors, but also for any student wanting to write a substantial thesis and corresponding speech for delivery. Rhetoric Thesis prepares students to meet the challenges of college-level writing in the liberal arts tradition. The thesis paper is the culmination of classical students’ high school scholarship, as it provides an opportunity for them to showcase not only their content knowledge but also their ability to engage persuasively in “the Great Conversation.” The thesis process—from the initial stage of finding a topic to the final day of presentation—is a jungle within which many students quickly find themselves lost. This course is a step-by-step guide that leads students through the process of writing a thesis paper, helping them avoid the typical false starts and dead ends of the journey. 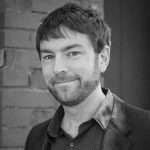 The course instructor walks alongside students as they engage in the challenging task of preparing and presenting a thoughtful, original response to an issue. Grounded in classical rhetorical theory, this course guides students through the 5 canons of rhetoric, piece by piece, as they write the 6 sections of their oratio. Students will ultimately become thinkers who can combine their wit, wisdom, eloquence, reason, and ethics for future writing endeavors. Students should have a working knowledge and familiarity with the informal fallacies (a good preparation would be Scholé Academy’s Informal Logic course or The Art of Argument text). Students should be able to apply the principles of formal argument construction (along the lines of Scholé Academy’s Formal Logic course or The Discovery of Deduction text; also, Scholé Academy’s Persuasive Writing course or The Argument Builder text). Students must have completed Rhetoric 1 or an equivalent course studying the nature of rhetoric for the modern student; the common topics; the rhetoric processes of invention, arrangement, and style; and a wide range of schemes and tropes. Students enrolling in this course should also be proficient in the use of MLA writing standards, employing those standards consistently in their own writing when necessary. This style manual is widely accepted for college students and academics, and beginning to adhere to writing standards is essential for college-bound students. Q: Why do students need a thesis? 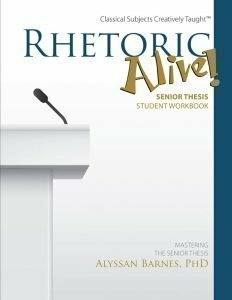 A: Dr. Alyssan Barnes, author of the Rhetoric Alive! series, addresses this question in her article From Sophomore to Senior: Why Students Need the Senior Thesis.